When we first started researching the best rain boots for walking long distances we quickly discovered that traditional rain boot options were very limited. Rubber rain boots are great for keeping your feet dry during short walks but they are not ideal for all day wear or heavy walking. This is due to the reality that rain boots have horrible traction (weird, right? ), poor comfort features and little to no support in comparison to boots that are actually made for walking long distances. We dug deeper and discovered these 6 waterproof boots that are comfortable enough for daily commuter walks, long work days and everything in between. So put down your rubber Wellington's and pick up these boots that you wouldn't mind walking a mile (or three!) in. LaCrosse is a company known for their quality outdoor gear and are really well known for their premium waterproof hunting boots. With the Hampton 3.0 they decided to introduce a everyday rain boot that matches the quality and comfort LaCrosse in known for. The LaCrosse Hampton puts an emphasis on walkability and comfort with features like a removable EVA footbed, a high traction outsole and convenient pull tabs for fast off and on. These boots are completely waterproof thanks to their hand-laid premium rubber and neoprene uppers. For those who need a little extra warmth during colder months the Keen Anchorage II boots are a great option for trekking through the rain, ice and snow. These waterproof boots offer a thermal heat-shield footbed to capture warmth while still allowing your feet to stay dry with a breathable membrane. For those long walking days, these boots will keep you comfortable, dry and safe thanks to their Keen rubber snow and ice grip outsoles. These boots are the ultimate waterproof work boots for those working on rainy and muddy days. 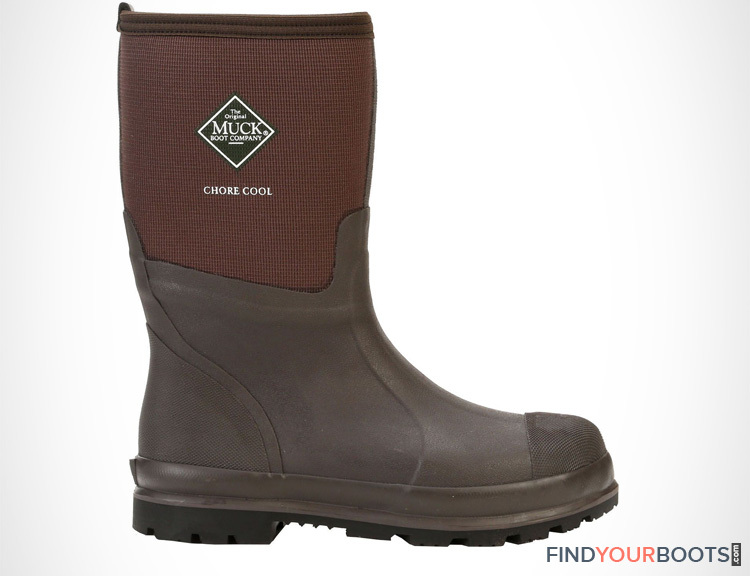 The MuckBoots Chore Cool are made to handle tough environments while still keeping you dry, comfortable and safe. Made as a year-round boot, the Chore Mid can be worn anywhere from 40°F to 95°F while keeping you comfortable thanks to it’s moisture-wicking lining. It’s exclusive Vibram outsole is lugged and meant to keep you from slipping while on the move. These boots are loved by many and often used for long days on the feet. 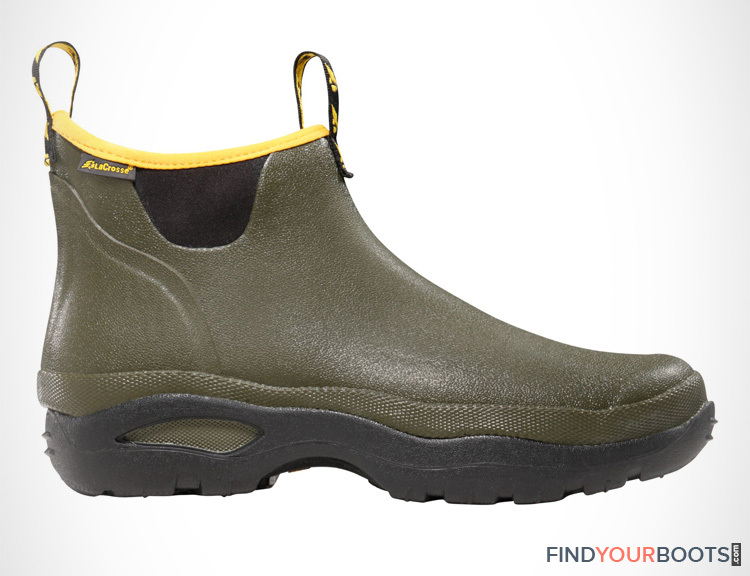 It’s no wonder why so many people use the MuckBoots Chore as their go to work boot on bad weather days. These are the boots to choose if you are looking for the perfect pair of waterproof commuter shoes for daily city or campus walking. Merrill is known for their high quality hiking boots and have offered a casual style with the Merrill Epiction boot that rivals their hiking boots in quality and comfort. These boots are also waterproof which makes them one of the best rain boots for walking long distances. A removable footbed means you can choose to use your favorite insoles. And their style is versatile enough to wear to the office or on a night out. The “WP” stands for waterproof and these Palladium boots definitely get the job done on those rainy days. The Palladium Pampa Cuff Lux boots made the list because they are light weight, as comfortable as a tennis shoe and look great on the feet. They are also a far more comfortable option than rubber rain boots because of their excellent sole traction and cushioned EVA footbed and outsole. Danner has release a versatile waterproof boot that can be used both on the trail and on the sidewalk. What we love about these boots is that they are a mix of the casual comfort of a sneaker and the rugged support of a hiking boot. Danner’s proprietary Danner Dry technology allows for these boots to be completely waterproof. Add in an Ortholite footbed, cushioned EVA midsole and you have waterproof rain boots that are perfect for all day wear. Traditional rubber rain boots such as the popular Wellington style boot pictured below are perfect for those rainy days where splashing through puddles is unavoidable. But as walking boots they do a lackluster job at keeping your feet comfortable enough for long urban walks or hard days on your feet at work. Tall rubber rain boots like these are actually pretty horrible for long walks. The outsoles on traditional rubber rain boots have notoriously bad traction. Read any "rain boot" review and you'll see what we mean. Although they do great in the mud and for walking through puddles, they are slippery and unsafe on smooth surfaces. 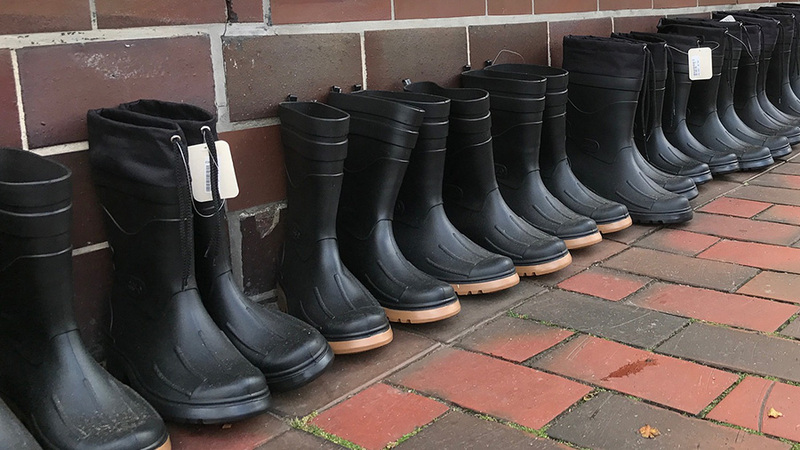 Even trendier rain boots such as duck boots and other stylish rain boots for men often do not have the traction needed for diverse surfaces or the comfort driven features needed for walking long distances. Since the main purpose of a rubber rain boot is too keep your feet dry, you’ll find features like a comfort footbed, cushioned sole and other features that typically make boots comfortable for walking long distances severely lacking. This is why we decided focus instead on finding comfortable waterproof boots that would be great for walking long distances. And another reason to think outside the box when looking for versatile rain boots that you can actually walk a mile in. We compare the iconic LL Bean Boots to the most popular Sperry Top-Sider duck boots. Find out which duck boot brand is a better buy. We review and compare the best snow boot brands of 2017. A list of the best good quality winter boots you can buy right now. Ditch the rubber boots and upgrade to these cool rain boots for men that are as stylish as they are functional.